I've always been a BIG fan of stuffed animals - in fact, I just came across a tub of my childhood stuffed friends in the basement, and my parents sent home a nice big box full of stuffed Sesame Street characters last week. It seems my kids are following in my footsteps, too, picking up new furry friends at each holiday and when I can't resist a sweet plush face grinning at me from a shelf. 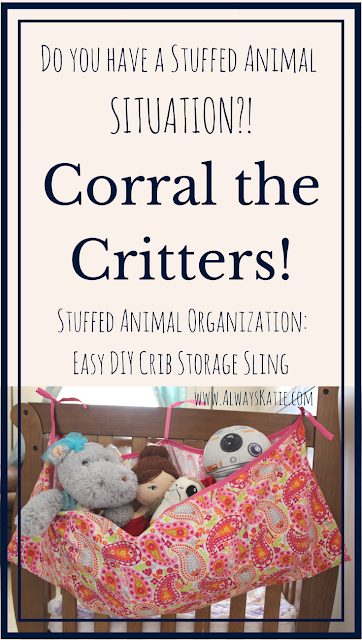 :-) So, suddenly, it seems we need to figure out some stuffed animal storage solutions! I had a fairly specific image in mind, but I couldn't find any patterns or tutorials on Pinterest that fit that vision very closely. I love this one from Lemon Squeezy Home, but we don't currently have corners open for them, and I'm not sure whether or not we will in the kids' big kid bedrooms. I also like the idea of using fitted sheets, this one from FaithTap and this from DIY Booster, but the elastic looks a little bit schlumpy to me somehow. 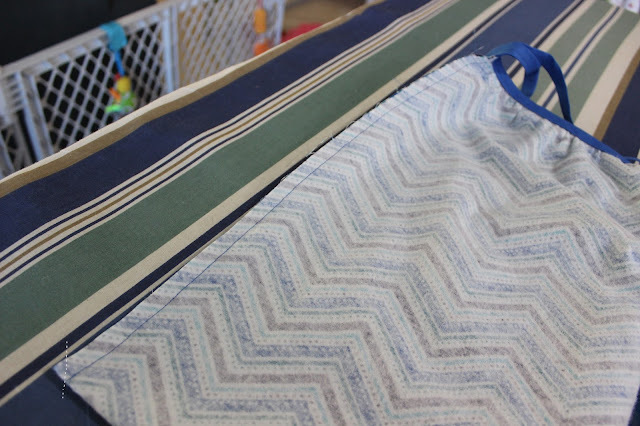 So I picked up some snuggle flannel and bias tape from Joann Fabrics and combined the ideas into something that I think will work for our family! Usual sewing tools: rotary cutter, cutting mat, pins, wonder clips (this is the set I bought in November, LOVE them!) sewing machine, etc. 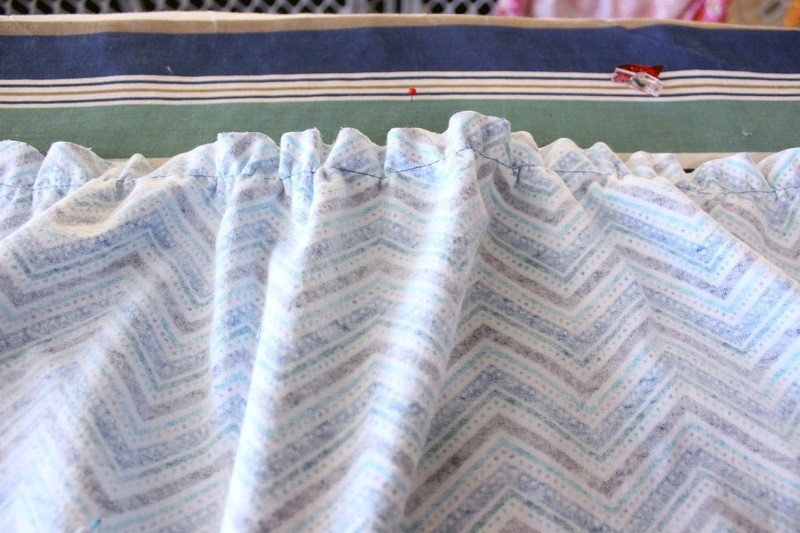 Set your machine to the longest straight stitch it can do, and baste along one long edge about an inch in. Gently, gently tug on the top thread to gather the edge until it measures about 28 inches. 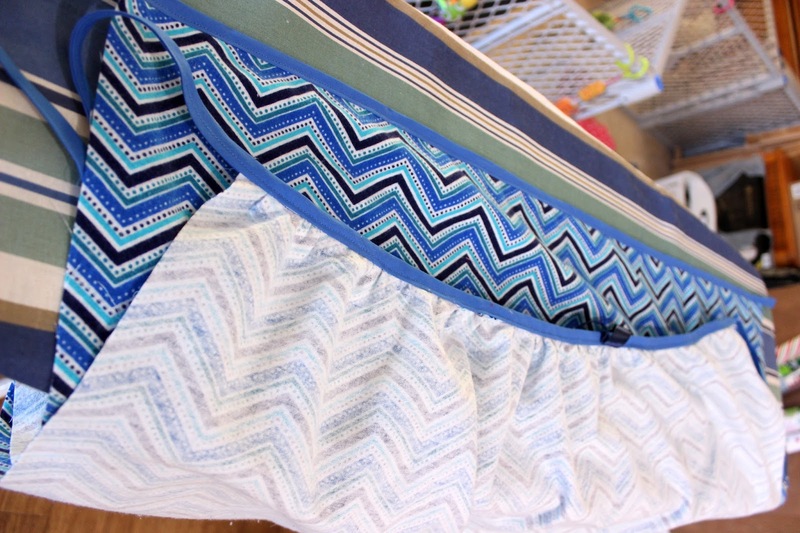 If your crib's side is shorter or long, adapt the final length to your preference. I tied my top and bottom threads at each side to prevent the gather from slipping. This project is the first time I ever used bias tape correctly! I followed this tutorial, which I found straightforward and easy. Unspool the whole package of bias tape, find the center (1.5 yards in), and cut the tape in half. Mark the center of the gathered side of fabric and the center of the cut piece of tape. Align these two marks when attaching the bias tape according to the tutorial I mentioned above. The bias tape will secure the gather. 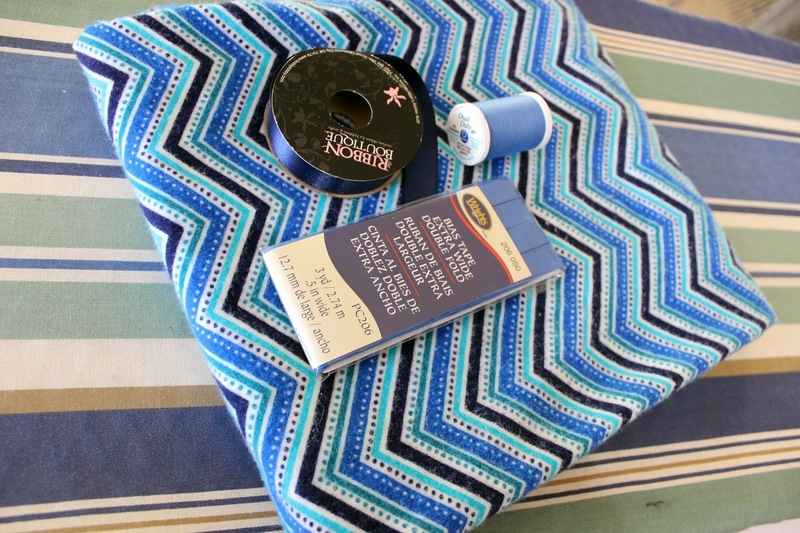 Once you've done both steps of sewing the tape down, find the center of your ribbon and the center of the tape, and sew the ribbon to the tape on the "right" side of the fabric. (I sewed mine to the "wrong" side and regretted it.) Gently pick the basting stitches out, they've done their job. Attach the other half of the package of bias tape to the other long end of the fabric, NOT gathering the fabric beforehand. This means that this long side, the front side of the sling, will be several inches longer than the gathered back side. Line up the short sides carefully. right sides together. Pin/clip in place, then sew. 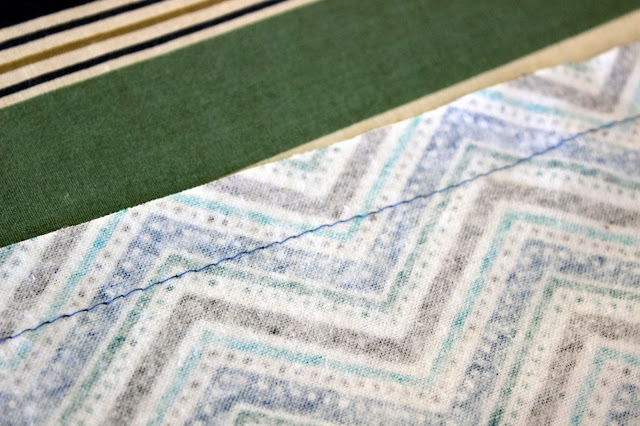 Stop and backstitch securely just before you reach the bias tape. You do NOT want to sew the tape together! 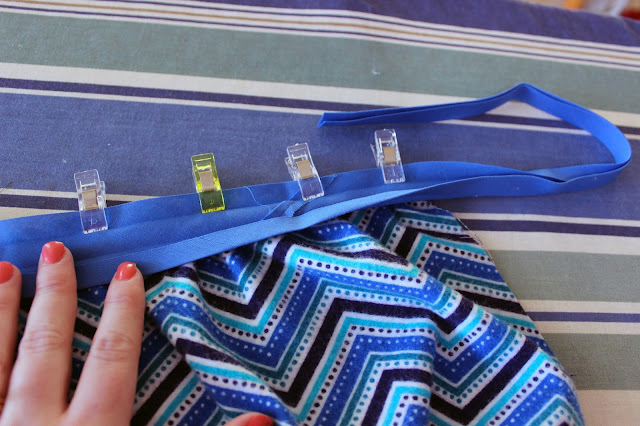 Clean up stray threads, clip the bottom corners so that they're sharper when turned out. Turn inside out, tie to crib! Abbie and Sam each have one of these now, and I think I may also make an extra one or two to hang on the baby fence around our great room. :-) So quick, easy, and useful! 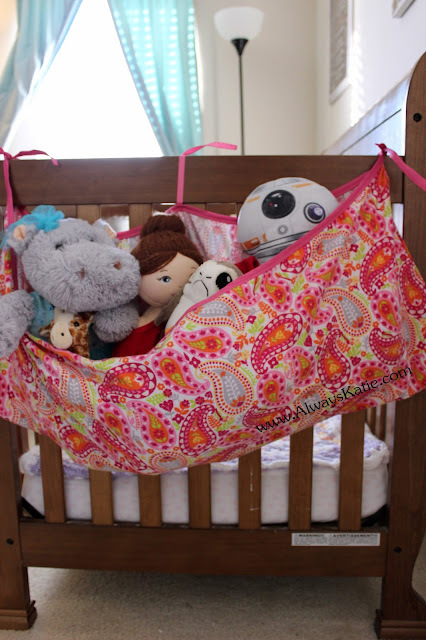 I love the way the back stays more or less flat against the side of the crib, but the front bows open slightly to make it easier to get the stuffed animals in and out and makes the sling a little bit roomier. Are your kids into stuffed animals? How do your corral the critters?